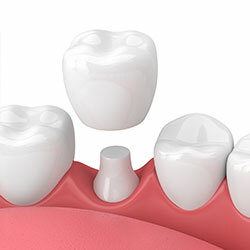 A tooth may require a crown because an existing filling is already very large. If we were to replace the large filling with yet a larger filling, either the tooth or the filling will break under normal wear and tear. Crowns are also needed for teeth that have undergone root canal treatment, or have been severely damaged by trauma. A crown provides necessary strength and stability for optimal function. A crown is basically a replacement for the outer layers of a tooth. It “caps” the portion of the tooth above the gum line. Dr. Dickinson has treated thousands of dental patients with beautiful, long-lasting crowns from our relaxing, comfortable Arlington, WA dental office. All-ceramic crowns from Dr. Dickinson have better aesthetics and, depending on the ceramic type, can even be stronger than traditional porcelain and metal crowns. Our crowns are made locally in Everett, WA by a lab that utilizes cutting-edge technology and the highest-quality materials. Crowns are long-lasting restorations that could potentially last a lifetime. You will need to care for the crowned tooth just like any other tooth with proper brushing and flossing, and twice-yearly visits to our Arlington, WA dental office for professional cleanings.